24 Hour Comics, edited by Scott McCloud, with stories by Neil Gaiman, Steve Bissette, and more. 24 Hour Comics Day Highlights 2004, including Josh Howard, Christian Gossett, and over 20 more. 24 Hour Comics All-Stars, with tales by Scott McCloud, Paul Smith, Sean McKeever, Tone Rodriguez, and more. 24 Hour Comics Day Highlights 2005, including Svetlana Chmakova, Zander Cannon, and over 20 more. 24 Hour Comics Day Highlights 2006, including Frazer Irving, Steve Troop, Rob Osborne, and more. Over a decade ago, Scott McCloud (comics' leading theoretician and the man behind Zot! and Understanding Comics) came up with a creative challenge: to write and draw a complete 24 page comic book story in 24 consecutive hours. Since then, hundreds of cartoonists including some of the top names in comics have taken that challenge. 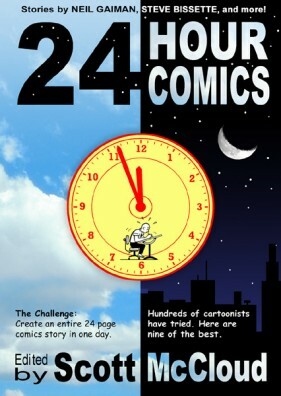 Now Scott McCloud himself has edited 24 Hour Comics, an anthology presenting 9 of the best of these experimental works. See what Neil Gaiman, Steve Bissette, Al Davison, and half a dozen others can do with nothing but a day, some art supplies, and a copious mixture of will power and caffeine. Each entry will have a new introduction by McCloud, who will also explain the history and rules of his 24 hour comic challenge. This book is a convenient 5 1/2" x 7 3/4" package which keeps the price of this 240 page black-and-white book down to an affordable $11.95 US. The book is now available in better comic shops and bookstores. Finding 24 Hour Comics books: Your best bet is to go to one of the comic book stores that hosted 24 Hour Comics Day events, as they're most likely to have them in stock. If you don't have one nearby, try the Comic Shop Locator Service. While many stores won't have them in stock, a good comic shop should be able to order any of these books for you. You can also obtain these books through online retailers such as Amazon.com - but if you can, support your local comic book store instead. Comic books have thrived creatively largely due to the existence of specialty stores.